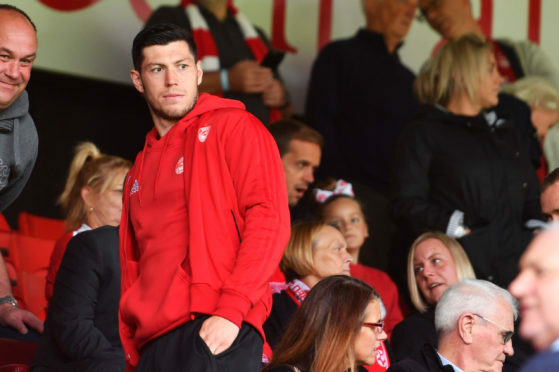 Scott McKenna has missed time due to a hamstring injury and suspension this season. The Aberdeen defender was unsuccessful with an appeal yesterday against the suspension brought forward by the SFA, with manager Derek McInnes breaking the news to a surprised McKenna. A fast-track notice of complaint was issued against the Scotland international on Wednesday for the incident, which was seen by referee Bobby Madden and no foul given. The punishment means the 21-year-old will miss tomorrow’s game against St Mirren and the trip to Tynecastle to face Hearts after the international break. McInnes maintains his player’s innocence despite the outcome of yesterday’s hearing, insisting McKenna was making a clearance to keep the ball from Edouard rather than a challenge. McInnes said: “Scott was in shock and was as disappointed as me when I told him. I felt I had to tell him rather than him hearing from somebody else. He is disappointed because he has missed enough games this season through injury. Devlin has also missed games through an unwanted and a harsh suspension. Getting the two of them finally together over the last few games has been a benefit to us. “I feel, and we feel, that it was a clearance. It’s not a two-footed lunge as one or two people have reported. It was a clearance with his right foot. He’s running at full speed to get to the ball ahead of Edouard and he’s actually cleared the ball with his right foot. In doing so, with the two players colliding, he’s propelled himself into him. It’s a kicking action to clear the ball. It’s not a tackle, it’s a clearance. That must be important in all of this. It is the third unsuccessful battle the Dons have had with the SFA’s appeals panel, following dismissals for Shay Logan and Mikey Devlin that were not overturned. McKenna has already missed three weeks of the season due to a hamstring injury picked up on the opening day against Rangers. The Dons manager criticised the panel previously following the Devlin decision, branding them “incompetent” and hitting out at the lack of transparency. Rangers’ striker Alfredo Morelos had his sending off against Aberdeen – for kicking out at McKenna – rescinded by the SFA.